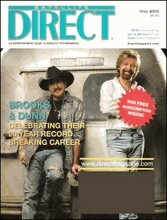 Satellite Direct Magazine is the number one guide to DIRECTV Dish! Satellite Direct has 24-hour grids for all time zones and daily pay-per-view listings. Satellite Direct also includes programming highlights and a list of "Best Bets" for each and every day. Within the grids, readers will find exclusive symbols letting the reader know which movies are wide-screen, Oscar-nominated, and Oscar-winning. In each Satellite Direct readers will find a pull-out directory, sports schedules, movie reviews and a feature cover story within about current television programs and movies.